Amazon extensions are something that not many sellers leverage. But I guess this is completely understandable. Mobile phones has slowly inched its way as the top platform on how we connect, and do business, in this modern age. And this is why Amazon Google chrome extension apps are deemed limiting…….old tech even for many sellers. But then again, there are Amazon sellers that still prefer handling their online retail business on Amazon the “old skool” way. 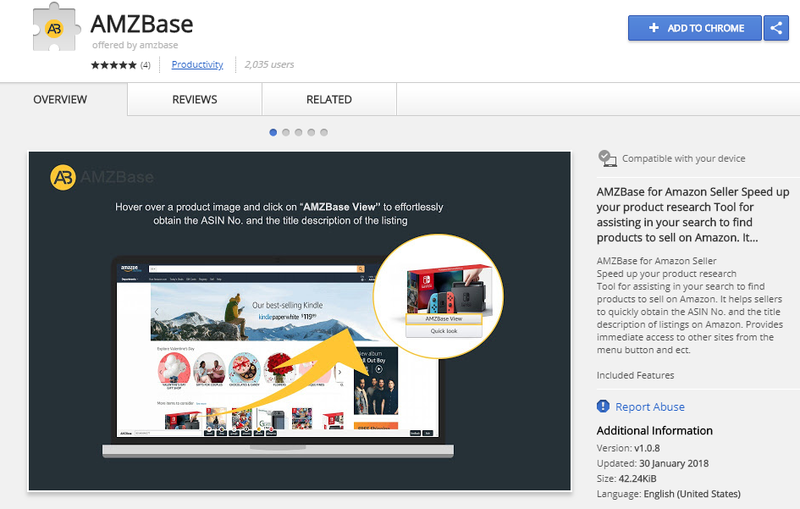 And if you are one of those individuals, and more importantly, if you are an FBA seller, then having Chrome web store extensions for Amazon is a must. 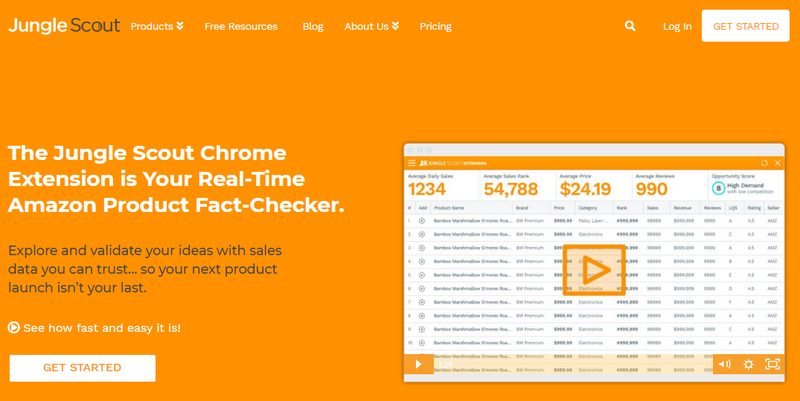 This Amazon seller Chrome extension by Hellium10 is free to use. But if you want additional features, it also has a premium version. It has a wide range of tools, 12 to be precise, that can help you with managing your products, as well as a keyword tool for optimizing your listings. 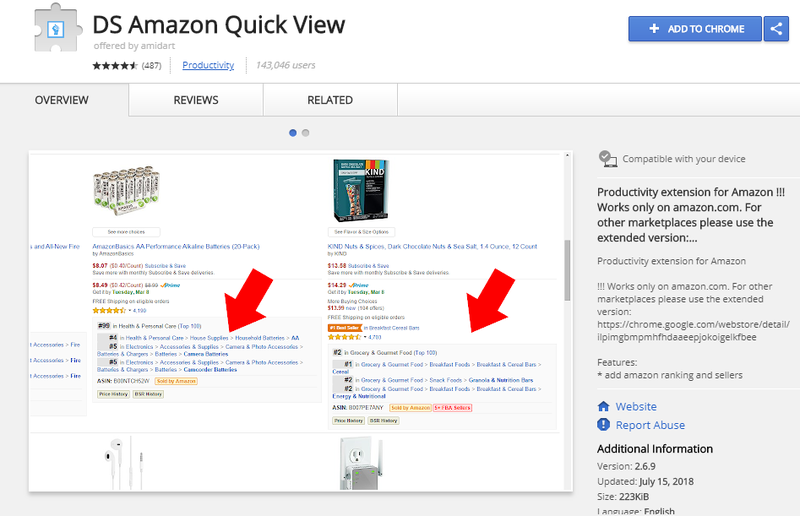 The interface for this Amazon Google Chrome extension is sleek and user friendly. 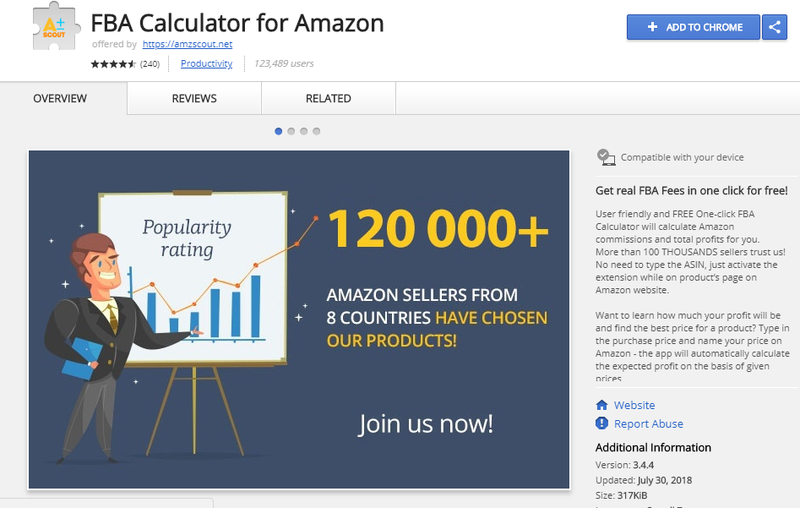 If you’re a seasoned Amazon FBA seller that is looking for Chrome addons for Amazon, then I suggest you go try out this app. 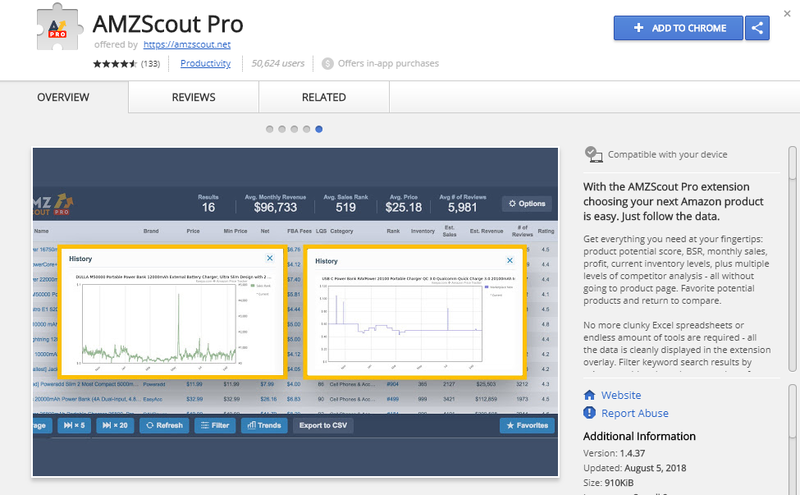 Coming from a trusted name in the Amazon seller community, the Jungle Scout Chrome extension allows you to analyze product data in real time. This AMZ seller browser app allows users to find and analyze products and get important data about it. Features for the app includes; industry leading data accuracy, monthly revenue and sales info, and review and rating tracking. And though this Amazon Chrome app is a bit pricey at $97, it is only a one-time fee and comes with a 100% money back guarantee. This Google Chrome Amazon app allows sellers to check their monthly sales/profits and BSR without having to go to their product’s page. It does this by automatically collecting your data after initiation. Using AMZScout give you real time price, income and sales data, everything an Amazon seller needs to get ahead the competition. If you are looking for an Amazon app for Google Chrome that can help you research products much faster, then this is an app that you should consider using. Working with another extension, The Camelizer, the app gives you information about product history and rank, which in turn aids you in determining the best product to target next for your FBA strategy. It also has the added benefit of being able to see who else is selling the product that you are interested in. This is valuable as you have instant data to see if a certain product is already saturated in terms of availability on Amazon. And the best thing of all, the app is absolutely free. 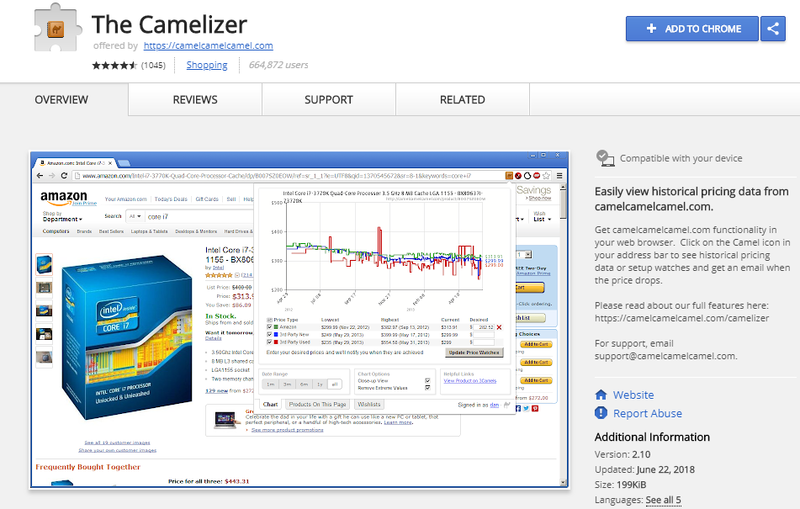 The Camelizer by CamelCamelCamel is a no fuss Amazon Google Chrome extension. As stated above, this app works great with AMZ Seller Browser. Upon activation, it provides you with up to date price graphs for every product you visit. It also allows you to monitor a specific product and get notified is and when price movement happens for said product. The Camelizer does not require any in-app purchase and is completely free to use. 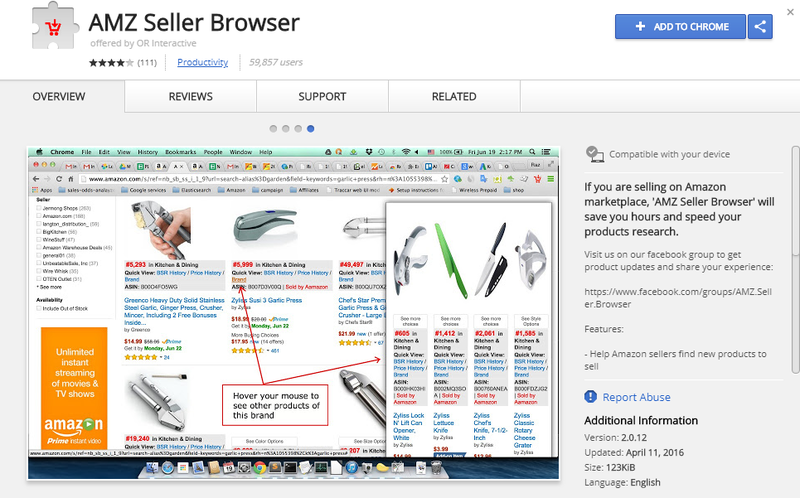 This Amazon seller Chrome extension has a free and premium version. It allows FBA sellers to see seller and ranking information by just hovering the pointer on a product image. Now there really isn’t much difference between the free and premium version aside from tech support, which I find strange. But then again, that’s a win for FBA sellers right? This is an Amazon seller extension that I actually used before I joined SellerLift. What I liked about it is how easily it allowed me to conduct my FBA product research. It does this by giving you the ASIN and description of a listing you’re doing research on. For a free app, it had a lot of useful features like, listing info about products on other retail platforms, basic Amazon SEO tool, ability to calculate profits, and historical price of any product. Like I said, I enjoyed this app immensely. And I’m sure you will too. If you hate working with numbers, then this is one of the Amazon extensions featured here that you need to have. First, it’s free. Second, it figures out your Amazon commission and profit for you. A great tool for both new and old Amazon FBA sellers that wants to know how much money are they making, or losing, on Amazon. To use this app, all you need to do is go to your product page and activate the app. The tool will then calculate everything for you. You get data on expected product profit and its best price. So if you want an Amazon seller extension that works as your own personal accountant, then look no further. This is by far the most recognized, and most used of all the Amazon extensions featured on this article. And for good reason too! 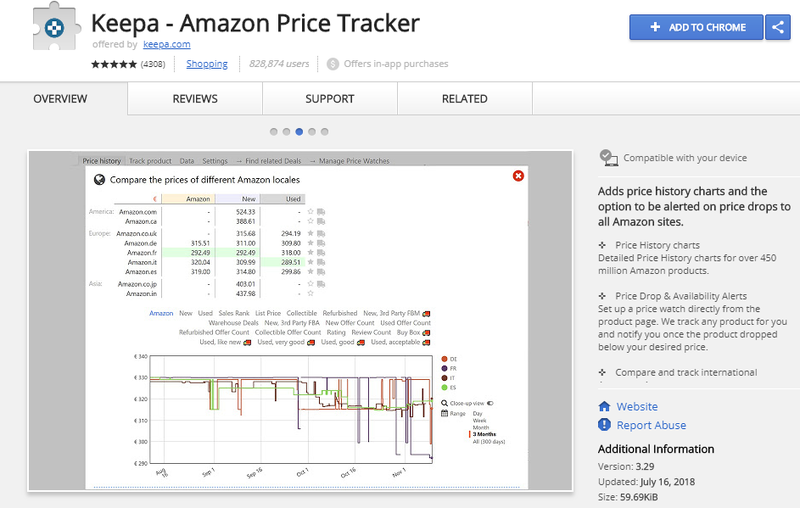 The Keepa Amazon chrome plugin boasts of providing FBA users with a comprehensive data about product history and price movement. After installing the app, Keepa will automatically reveal up to date price history of any product on Amazon. This functionality allows for faster analysis of any product, which saves time, and allows its user to arrive at an informed decision much quicker. The only downside I personally saw is that it does not track shipping costs. But then again, it is free to use, and does not even require you to register. A great app for FBA sellers that wants to check their products, as well as those of their competitors. 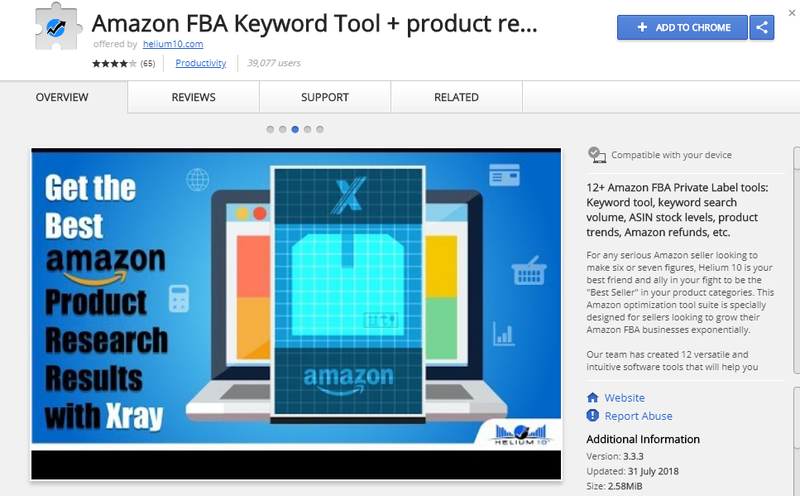 Will SellerLift Release Amazon Extensions For FBA Sellers? Of course we will! Fact is, we currently have a few Amazon Google Chrome extensions in the works. You see, though we are a new name in the industry, our Amazon Feedback Tool has been getting positive reviews from our customers. And we are looking for ways to add more features, to make it easier for you to manage and grow your Amazon business. From US, EU and Asian Amazon marketplaces, we have been getting emails as to how much our customers love our tool. And of course, we had a few suggestions from them too. And yes, you guessed it, one of those is a request for us to come up with an Amazon Google Chrome extension. We still don’t have a timeframe as to when we will release our Amazon Chrome plugin. But when we do, you’re assured of another innovative tool that will help you become the next Amazon success. And if youre an Amazon seller that is curious as to what SellerLift is, and why it’s becoming a buzzword in the industry, why don’t you see what all the fuss is about and register for our FREE 15 Day Trial! 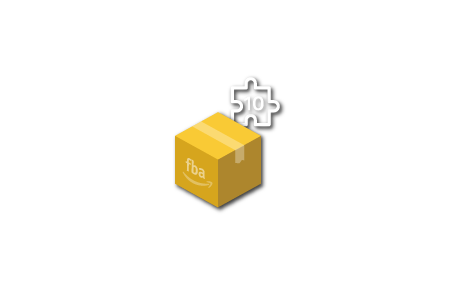 Anyway, I hope that this article about Amazon extensions for FBA sellers has helped you in some ways. If it did, or if you want to add more to this list, feel free to leave a comment below. Have a great day, and I will talk to you next time.